EMFusion is a small, privately owned business based in Topeka, KS, comprised of former Emergency Management professionals. Prior to the 2011 Annual KEMA Conference, the KEMA Board hired EMFusion as conference planners. While every KEMA Conference prior to that has been a great experience, the employees, experience and knowledge of EMFusion assisted in bringing the Conference to a new level. EMFusion provided the Conference Committee Chairperson (President-Elect) with assistance in the following areas: on-site hotel liaison, dedicated conference scheduler, hospitality assistance, logistics support and an event sponsor. Apart from the Conference, EMFusion has provided excellent support and service to the entire South Central Region. In 2011, this group assisted the South Central Region in performing a comprehensive Regional Hazard Analysis. At the beginning of the project, 13 counties either did not have a Hazard Analysis or it was not current. The contract called for an analysis to include only those 13 counties. However, by the end, EMFusion's final product included an analysis that included all 19 counties - all at the same cost. In other words, EMFusion provided a 19-County Regional Hazard Analysis which was above and beyond their original scope of work and contract. Recently, EMFusion took on the project of completing a Commodity Flow Survey for the South Central Region as part of a Hazardous Material Emergency Preparedness (HMEP) Grant. The yearlong project included meeting with every County's LEPC, the SC KEMA Regional group, Emergency Managers and some of the local Board of County Commissioners. The team created and analyzed surveys from local County Clerks, Fire Departments, Emergency Managers, LEPC members, HazMat Response Companies, Transportation officials and local Road and Bridge Departments. EMFusion facilitated and trained County personnel to do their own traffic count to get a hands-on approach to the hazardous materials being transported on the local roadways. This project has logged countless hours to benefit all local planners and responders, with the constant thought of not creating an undue burden on the Emergency Manager. While EMFusion is private, for profit company, all employees have stepped up and gone the extra mile with what they do for Emergency Managers and KEMA on numerous occasions and projects. Vivian is one of those that when asked for help, she jumps in with both feet. Some examples are; While Vivian was working at getting our Local Emergency Operations Plan updated, several of the SW Counties asked for help with theirs. Vivian has been sending examples on filling out the plan, and has even went to other counties to show how to use the website to enter the information. Vivian does most of this on her own time, as she is just a part-time person in my department. Vivian has also taken on the responsibility of getting a CERT program started here in Grant County. Vivian has set up trainings, with getting Law Enforcement, Fire, EMS, and behavioral health to help teach the units. Vivian has also worked very hard at getting our Debris Management, and COOP plans approved and updated. Vivian has shared many of our plans with other agencies, both public and private, to get our whole community better prepared. Vivian is very deserving of this award. Cpl. 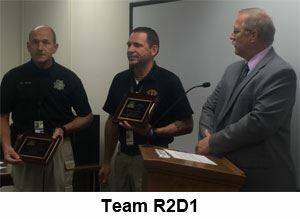 Mahan and Deputy Director Dusty Nichols are both members of the State Training Cadre and have instructed many KDEM sponsored courses all over Kansas. These two have developed and instructed “What is Something?”; a course that was specifically designed as a Situational Awareness tool that includes the “7 Signs of Terrorism and Crime”, weather awareness, personal preparedness, etc. The course is tailored to the organization/group the course is being delivered to. Currently “What is Something?” is offered as a standalone community course and is also being delivered as the first two hours of an 8 hour “Active Shooter for Health Care Facilities” that is instructed by the Shawnee County Emergency Management, Sheriff’s Office, Topeka Police Department and the State Healthcare officials. Team R2D1 are NIMS “True Believers” and incorporate their past experiences in the military, Law Enforcement, Fire, CBRNE defense, Anti-Terrorism, EOC Operations, unified command and PIO duties as well as education and experience as Planning Section Chief and Situational Unit Leader on the NEKS IMT to deliver a course that entertains and well as educates their students. Team R2D1 are a popular instructor team requested by name. Their dedication to their students truly understanding the material cannot be understated. Individually they are superior instructors and together they are entertaining, informative, effective and enhance the learning experience for everyone. Team R2D1 are exemplary and should be considered as Instructors of the Year. Carrie Boettcher is the first Emergency Manager for Emporia State University. This new position has been an experience for all involved, and she has taken on the responsibility with a lot of energy and determination. Through her efforts, ESU conducted its first exercise in over 4 years – a test of the emergency notification system! It was a very simple web-based tabletop exercise, but it was an incredibly useful opportunity to address the emergency notification process and to gain buy-in for continued involvement and improvement from the university. She has been vital in the implementation of monthly planning meetings with the Critical Incident Planning Group (CIPG) as well as a few joint meetings with the CIPG and the Executive Planning Group. As a group, they have been addressing revisions and updates to the emergency operations plan as well as a full commitment to develop a long-term plan for emergency notification and emergency communication. These are required elements for higher education and the foundation for which all other planning will grow. Additionally, she has built in emergency notification drills each semester which include text, web, social media, email, and their outdoor warning system. She continues to work with several departments on campus in the initial steps towards continuity of operations planning and including ICS and NIMS in events. This includes use of an IAP for a planned power outage and the community 4th of July fireworks celebration which has been held on ESU property for several years. Carrie is not just focused on internal preparedness. She understands the importance of fostering partnerships with external agencies before emergencies. One way she builds these partnerships with the community is through active participation on the Lyon County LEPC. Not only has she participated in the meetings, she has taken on a leadership role as the Vice Chair of the LEPC for 2014 and will be Chair in 2015. She is also an active participant on the Community Preparedness Committee which meets monthly. Carrie has seen firsthand how being an emergency manager in higher education comes with its own unique set of challenges to navigate. With that in mind, she has been a driving force to bring together higher education EMs on a quarterly basis to discuss successes and challenges they face to build more resilient universities. She also actively participates in the monthly NE KEMA meetings sharing the university perspective with local EMs. This has been a great opportunity to diversify the conversations and develop solutions to ongoing issues. Carrie is a great ambassador for emergency management! Her professionalism can be seen in her internal and external interactions. In her short time at ESU, she has made great strides to bring them up to speed on all phases of emergency management and to integrate the university into local community plans. This is why we believe Carrie Boettcher is the best candidate for Outstanding New Emergency Management Professional. John began his career with Cowley County EM in the summer of 2010. He hit the ground running with many of the projects. He took on the lead role in the county-wide narrow banding of all radios; worked with four cities to obtain new outdoor warning sirens and assisted in the purchase and distribution of four hundred NOAA All-Hazards Weather Radios during a county-wide preparedness campaign through the Hazard Mitigation Grant Program; updated all of the siren records for simplicity; and streamlined the siren activation process with infrastructure modifications. During the narrow banding project, John was able to facilitate and ensure that frequencies within the county were in compliance, unused frequencies were redistributed, licenses were updated and MOUs were put into effect. John obtained his KCEM and now serves as the KCEM re-certification officer for KEMA. He has been a KEMA member since he joined the agency. He is the County's exercise program officer and works with every entity to create, facilitate and evaluate the exercises within the County. He was the lead in a Region-wide Communications exercise for the South Central Region in December of 2013. John is the lead planner in the Regional Hazard Mitigation Plan project and he is currently working with all participating agencies to obtain resolutions and approval letters to finalize it. Currently, John is playing a major role in the development of the radio system to be installed in the renovation of what will soon be Cowley County's new Emergency Operations Center and county-wide PSAP. The process is detailed and technical and John is the "go to" guy in the County. His expertise in the field of radios has kept him busy helping other agencies as they also update their licenses and submit grant applications. John is a member of the South Central and Southeast IMTs and has completed all training requirements and received full certification as a Type III All Hazards Communications Unit Leader (COML). He was most recently deployed to Baxter Springs as the COML with the Southeast IMT. John brought his passion for Amateur Radios with him. 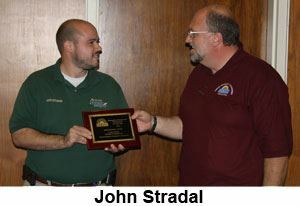 He has taught five separate Amateur Radio classes which has yielded nearly 40 new operators in our area. His most recent accomplishment in the amateur radio arena is the official creation of the RACES program, which is a first for Cowley County. John can be counted to take on any task without reservation. While he may still be fairly new in the field, his accomplishments match that of any seasoned veteran. It is a pleasure to nominate John for this award. Eldon Bedene has served Emergency Management for 42 years. He started in 1972 as the Director of Civil Defense which was part-time and without pay. Eldon continued this until 1985 when Crawford County became an EMPG county and at that time he went to work as the Jail Administrator and Crawford County Emergency Manager. Once Sheriff Horton became Sheriff of Crawford County Eldon mostly went full time emergency management until his retirement in 2013. After only 2 month Eldon returned Part-time as Emergency Manager. In 2014 Crawford County decided to have a standalone Emergency Management with a separate location. Being part-time this is very challenging. Eldon has been an icon in the Southeast Region for a very long time. He has shared his many years of knowledge as well as being readily available to help anyone of us in the region or outside of the region. Eldon is also active in the Four Corners Emergency Management and continually networks to better serve Emergency Management. John started his association with Sedgwick County Emergency Management in 1980, first as a member of the volunteer Fire Reserves, where he eventually rose to the position of Fire Chief. Among other significant events in that capacity, he was involved in the response to numerous wildfires throughout the county, as well as the McConnell/Andover tornado of 1991 that killed seven people in Sedgwick County. John became a full-time emergency manager in 1992. He established the Sedgwick County's RACES team and remains active with those volunteers to this day. He also serves as the coordinator for the county's other volunteer teams: K9 Search and Rescue, the Emergency Support Unit, Wichita-Sedgwick County Fire Reserves, and both the Bentley and Viola Volunteer Fire Departments. Some of the disasters he worked included the DeBruce Grain explosion and Halloween flood, both in 1998, the Haysville/South Wichita tornado in 1999, and the Barton Solvents explosion and fire in 2007. He also led the strike team of Sedgwick County volunteers that responded to Greensburg in the first few hours after the killer tornado. In 2009 John was promoted to Deputy Director in charge of operations. He worked the 2012 Oaklawn tornado and also that year took on the assignment of upgrades to all 140+ outdoor warning devices in the county. The installation of new sirens led to a surplus of older equipment and John has gone out of his way to assist other counties throughout the state in making use of these sirens in communities that needed additional coverage. He represented his fellow EM's while playing a significant role in the recent development of the state's EAS Plan. John has not always been the most visible member of our organization, but instead has labored quietly behind the scenes for over three decades.